These earrings from The Queen's collection feature two large pear drop diamonds suspended from two smaller diamonds and set in gold, a simple but classic design for the use of large stones like this. 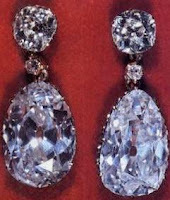 According to Leslie Field in The Queen's Jewels, they were created from family diamonds; they've been set in the current design since at least the 1960s. These are best known for being worn by one very famous member of the family: The Queen loaned them to The Princess of Wales for her tour of Australia and New Zealand with The Prince of Wales in 1983. (You may recall that Diana was also loaned the King Faisal Diamond Necklace at this time.) I don't believe that they became a steady part of Diana's collection after that, so they were possibly just on short-term loan. Since then, they have returned to their status as infrequently worn members of The Queen's earring collection, at least when it comes to public appearances. Even when they are worn, they are easy to mistake for similar designs, such as the Coronation Earrings or the Greville version. I can't help but think that makes them a good candidate for a loan to another family member, and hope we'll see them used as such again.